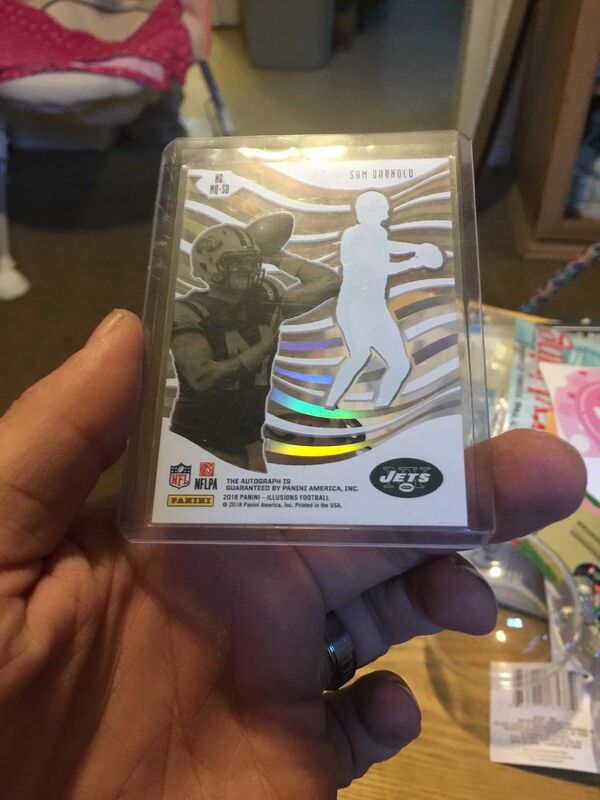 Earlier this week I blogged about those elusive missing autographs that have been coming out of 2018 Panini Illusions Football. I warned you that people would take advantage of that misprinted COA, and start signing them in an attempt to pass them off as the real deal. Well, that didn’t take too long. 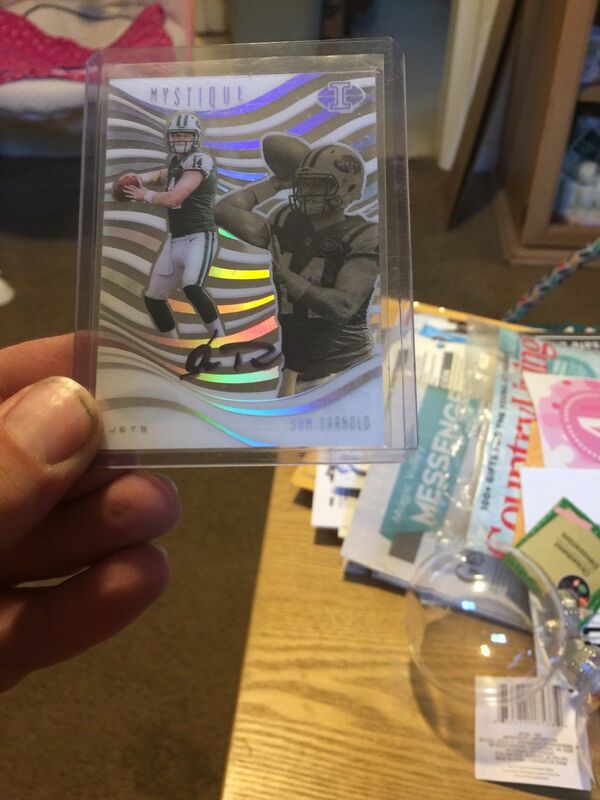 A seller on eBay that goes by “tolpul0” from Twin Falls, ID took a misprinted Sam Darnold card, signed it themselves, and is now selling it as an authentic autograph. What a total crock! Its sold too. Last I saw it had one bid for $20 with a few days to go. Not only is the autograph a terrible counterfeit, but its on-card. Authentic pack-pulled examples are all signed on stickers. PLEASE BE CAREFUL! It would be nice if those who pulled a misprinted error could exchange the card for something. The least Panini could do is give an official statement on the matter and/or give us an estimated print run of the errors. Last night while browsing through the card topics of the day on Twitter, I came across something interesting. Apparently some of the cards coming out of 2018 Panini Illusions Football contain Panini’s autograph certification message on the back, but lack the actual autograph itself. Contacting Panini wondering how you can get your autograph hasn’t brought the happiest of news either. According to those who have talked to Panini on this, you won’t be eligible for an autograph. These cards were never intended to be autographed, but somehow received Panini’s COA printed on the back. Its an error. 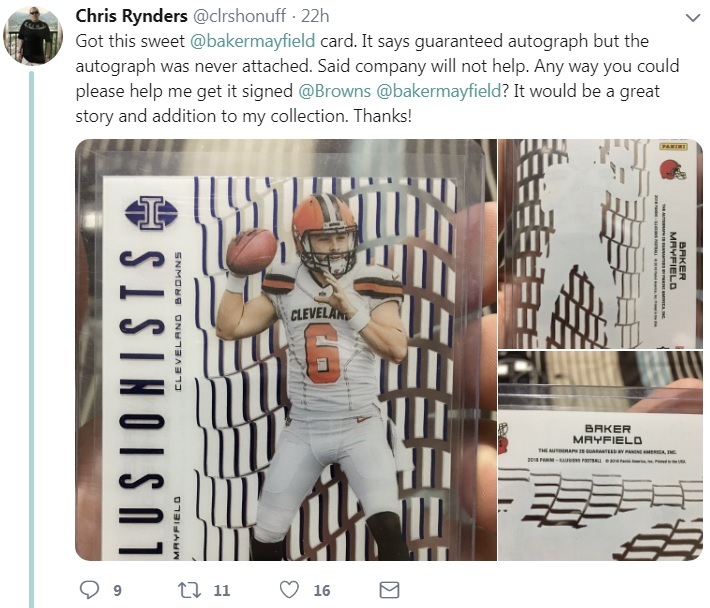 Some of the players this has happened to include Baker Mayfield, Tom Brady, Ben Roethlisberger, and Randy Moss. Just doing a quick search on eBay shows even more. From what I’ve seen, this error applies to the Living Legends, Illusionists, and Mystique inserts. Please be aware of what you’re buying. It wouldn’t take much for a scammer to forge a signature on the front, and attempt to pass it off as the real thing. That COA easily opens the door for people to do this. You have to admit that its pretty ironic that something like this happened with a product called Illusions.